Kamrup (M) DC Virendra Mittal and others at the launch function. 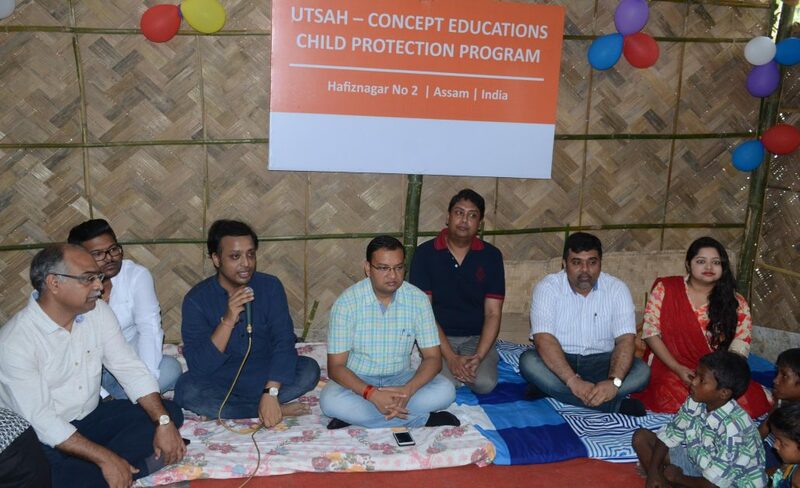 Guwahati based Concept Educations in association with UTSAH, a child rights agency, on Sunday launched the Child Protection & Education Programme for a new batch of underprivileged children and out-of-school children at Hafiznagar in Bamunimaidam in Guwahati. Every year this program is re-initiated to cater to a new group of out-of-school children. This is the second year of the programme. The child protection and study centre was inaugurated by Kamrup (M) DC Virendra Mittal. Representatives from UNICEF Assam, District Child Protection Unit, Childline Guwahati and Chandmari Police were also present in the inauguration ceremony. Through this programme, underprivileged children will be provided free education and child protection support. Teachers and facilitators have specially been appointed for this centre. Apart from the regular classes, the centre also has a lot of extra-curricular activities planned for the children. “We have been educating children for over 10 years now and have been doing such activities alongside. Our two-year-old association with UTSAH gives us the confidence of carrying out this project in the best possible way that can benefit the children,” Abhijit Dutta, CEO, Concept Educations said.